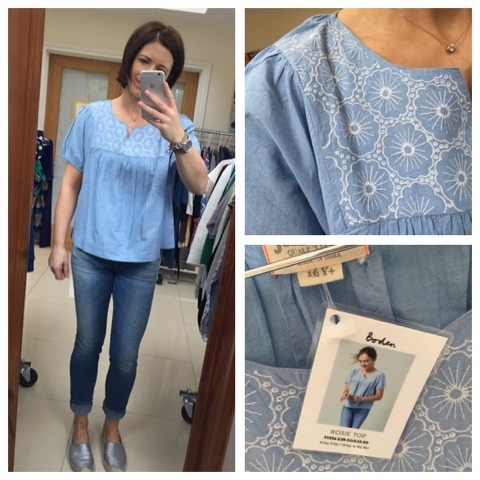 Finally, it's part 2 of the big Boden try on and in this post, I'm trying on all the clothing I had the time to (and that fitted me). Starting with some Johnnie B - always worth a look as the age 15-16 is in or around a size 10. 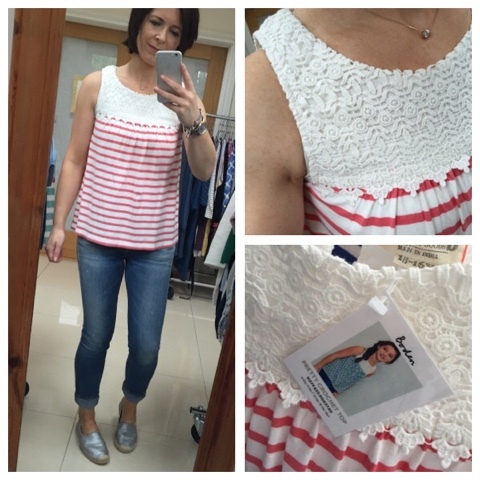 I liked this little top - stripy and loose on the bottom and with a heavier lacy yoke which allows it to hang nicely. This was the 15-16 and it was a bit neat on me - wouldn't suit a bigger bust. 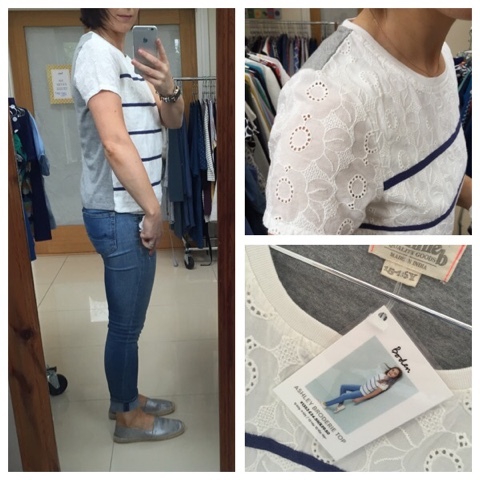 Next up, this broderie top is lovely - striped on the front and grey marl on the back. Again it was 15-16 so I felt I'd like to try the larger size. 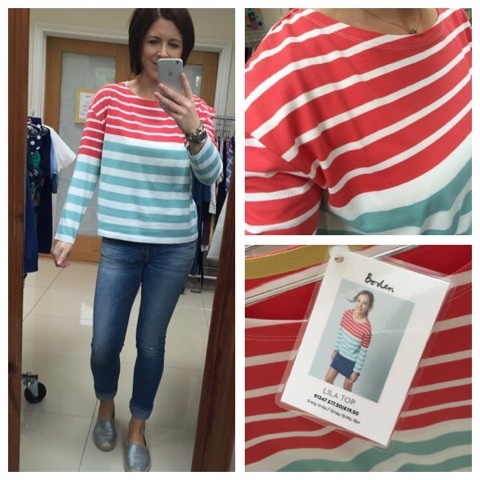 A lovely twist on a breton top. 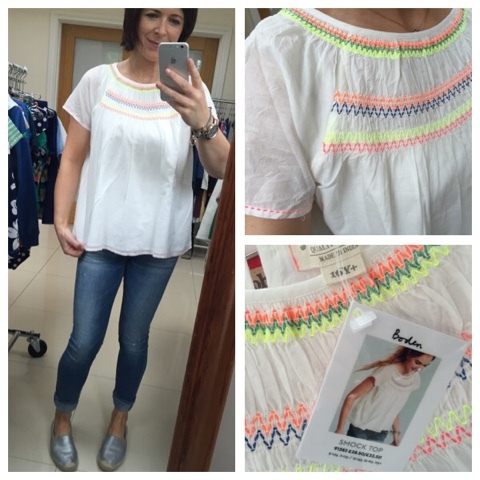 This next top is a great little cream one with a neon embroidered smock detail. It's the age 16+ again but is a better length than the Rosie top above. It's a bit loose perhaps but I loved the neon detail. Next up - this Johnnie B breton has a lovely mix of colours though I prefer the blue/yellow colour way that you can see on the link. It's the 16+ again and this time it felt a bit big so I'd probably go for the 15-16. 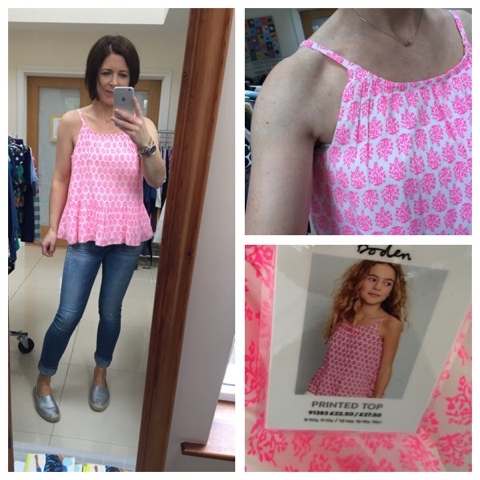 Finishing with this great sun top. I love a bit of neon pink and the shape of this is great. It fitted quite well too - not overly gapey under the arms etc. However, it's sold out in the 15-16 and 16+. The 13-14 might work for a size 6/8 though. Moving onto regular Boden now and I was disappointed that there were only 2 jackets in the party set. 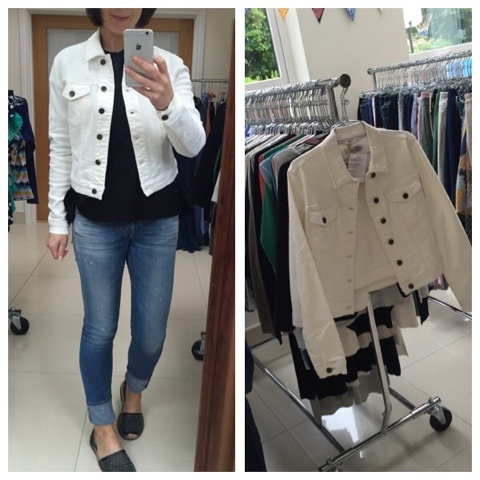 This first one is the Olivia Jacket - sold out in almost all the sizes in this cream colour way & the denim too. It was a bit short on me and I think that was the 12 so it must come up small. The Chepstow jacket was in the set in both cream and black. 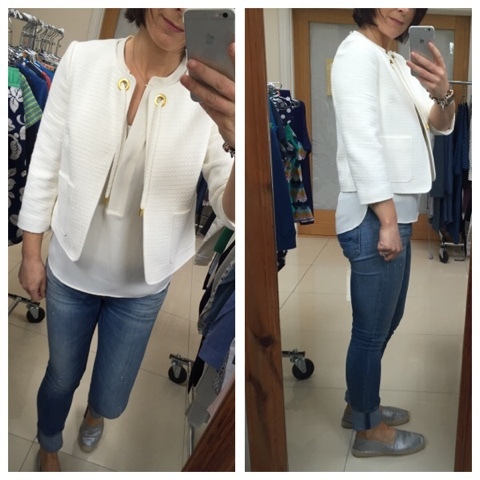 This is a size 8 in the cream and it's a gorgeous little jacket - easy to wear casually or formally. It's on 25% off at the moment too. 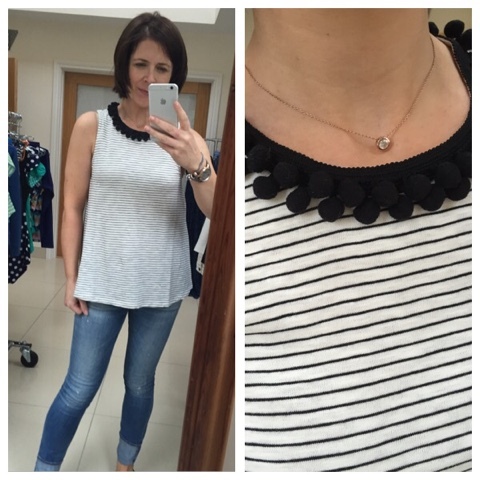 Moving onto tops now and the first one I tried on was this sleeveless striped one with pom pom detailing on the neckline. 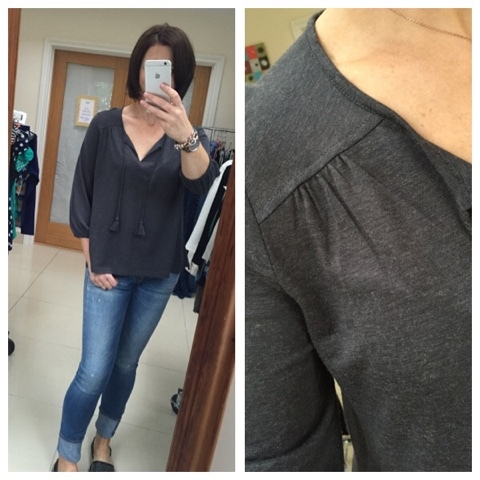 Next it's the Boho Jersey top - comes in lots of colours but I liked the grey the most. 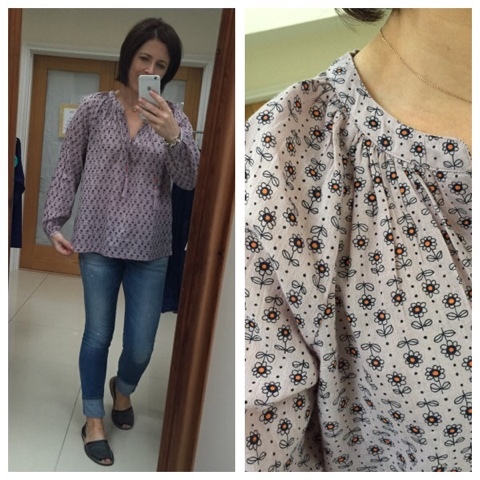 The pretty trim top was a surprise hit - it's got a gorgeous necktie and shape. I wasn't expecting to like it as much as I did. 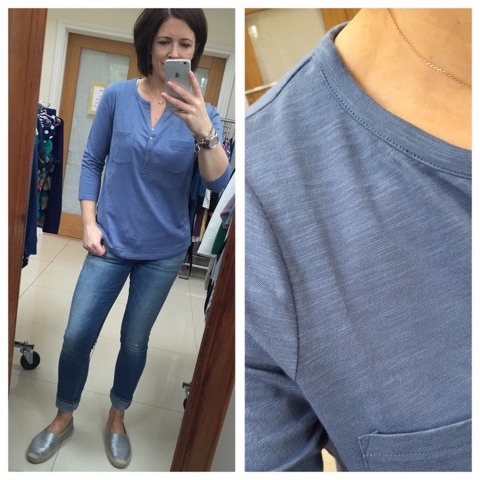 Loved the colour of this next one but the shape wasn't good on me - I think it's the long sleeves? 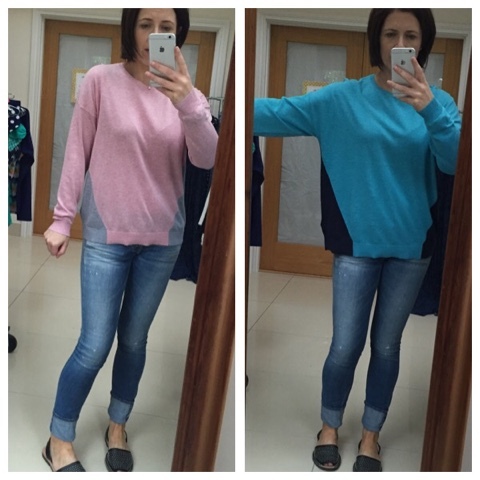 Some knitwear next and this Everyday jumper comes in a lot of different colours. The accent colour at the waist is very flattering. The pink is a 10 and I'd like it bigger so I tried the 14 in the blue. 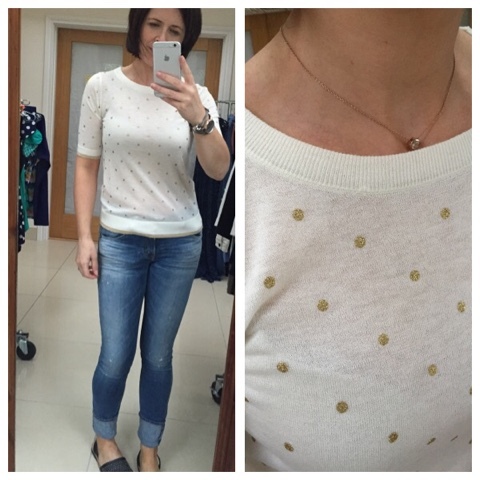 My favourite colour is the cream/taupe one that you can see on the link. 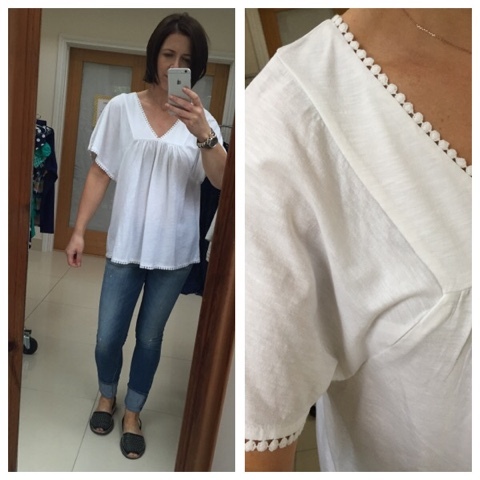 The bridget top was just ok - it looked best on me worn off the shoulder but the material and the tight elastic means it will drive you bonkers popping up onto your shoulders. Another knit here and I think this is a great work-wear piece. 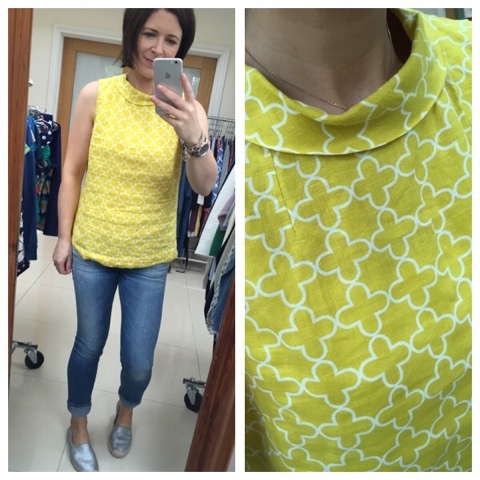 It's a neat 10 but would look great with tailored trousers or a pencil skirt. 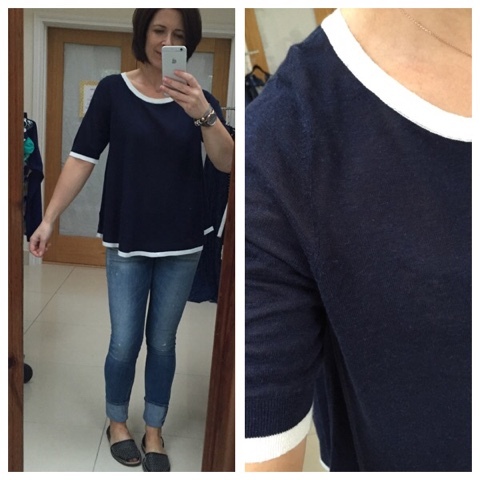 This swing knit top is a great all-rounder. Could be dressed up for the office or worn with jeans. 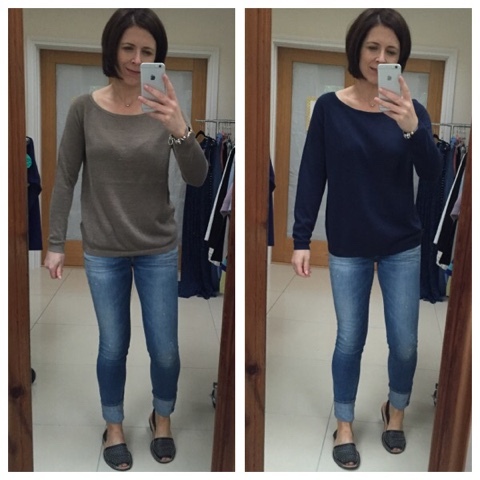 Next, I tried the Belle jumper in two sizes - 10 and 14. Definitely preferred the oversized feel of the navy one. Jumping around here to dresses but I can't get my photos to go in the order I wanted them to! Also, excuse the jeans in my dress pictures....it was just faster and easier to do them this way! 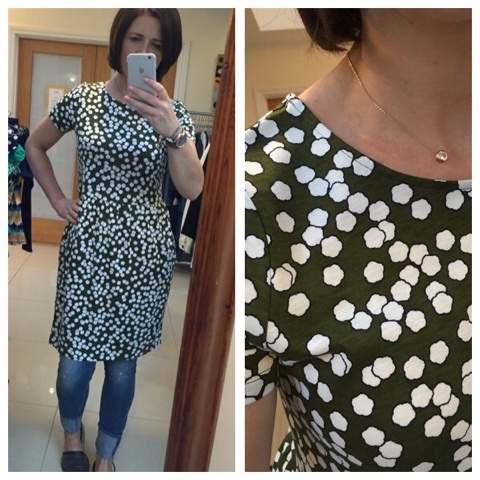 So this next dress is a lovely summer piece. I prefer the grey colour way online. Just a gorgeous print. 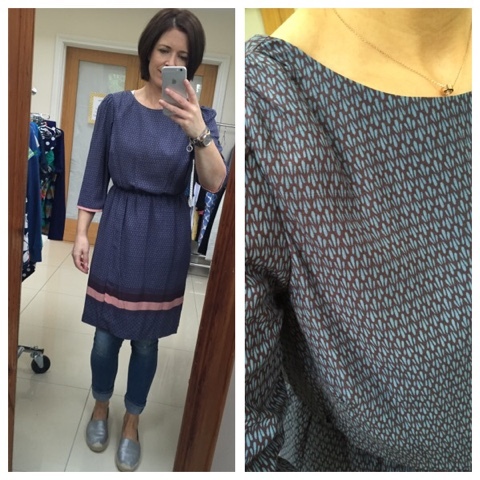 Loved the colour of this next Jersey dress - it has pockets and is so easy to just throw on. 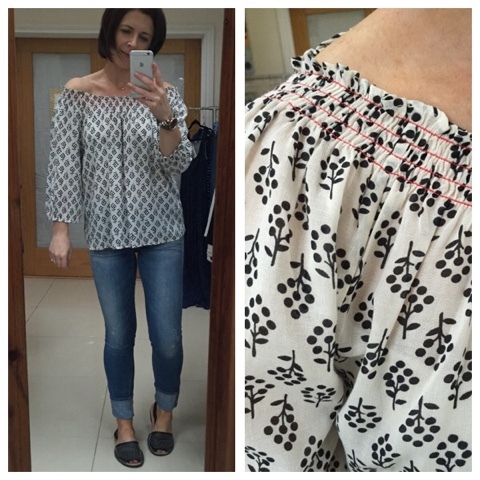 Back to tops now and this button down the back linen mix top was a good seller on the day. It comes in a couple of other colour ways if you don't fancy yellow. The perfect shape if you're not big in the bust area. 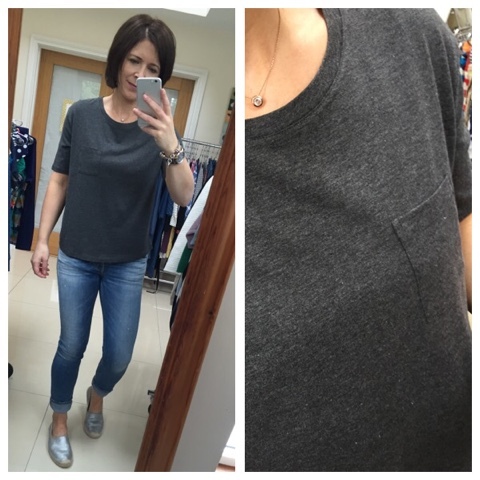 The supersoft boxy top was only in the set in a size 6 - so this gives you an idea of how boxy it is! I'm most definitely a 10 but it worked ok. Lovely soft cotton. A great wardrobe staple. Another jersey basic top - this is the 10 and I'd prefer it a bit looser so would size up. 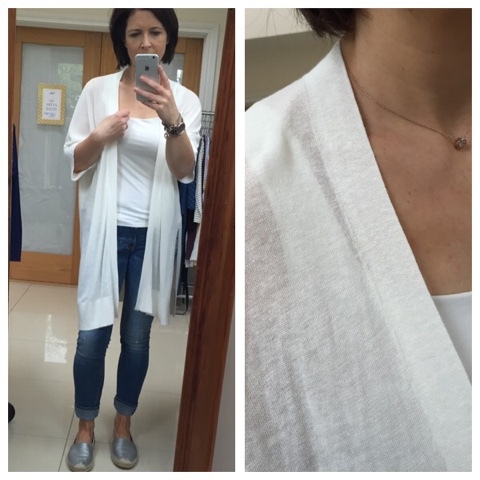 This linen cardigan was not a hit with me - it seemed a bit frumpy and had a hole in it too. The party is a great chance to see how the clothing survives lots of trying on and hanging/rehanging. This doesn't seem to be a great quality piece in my opinion. 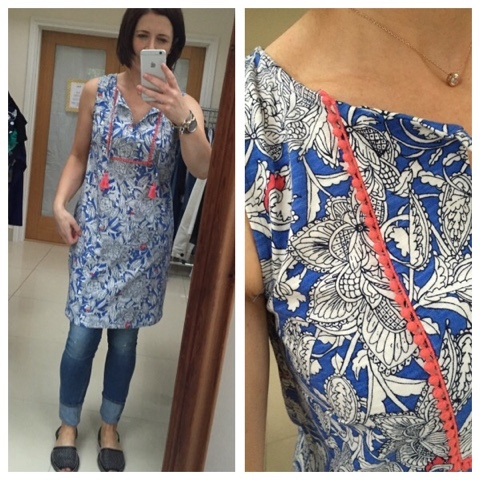 And back to dresses to finish - I love the shape of this but the elastic was so tight at the waist in the size 10. Was sure it would be one I'd really want to buy as the colours are great too but sadly, not for me either. And that's it - I think! I've so many photos on the phone, I am struggling to work my way though them! If I find any more, I'll add them in. In terms of what I ordered - well typically, I ordered 2 items that weren't in the set so I couldn't try them on. Once they arrive, I'll add them to this post so watch this space! Where are your silver shoes from I love them!